2. 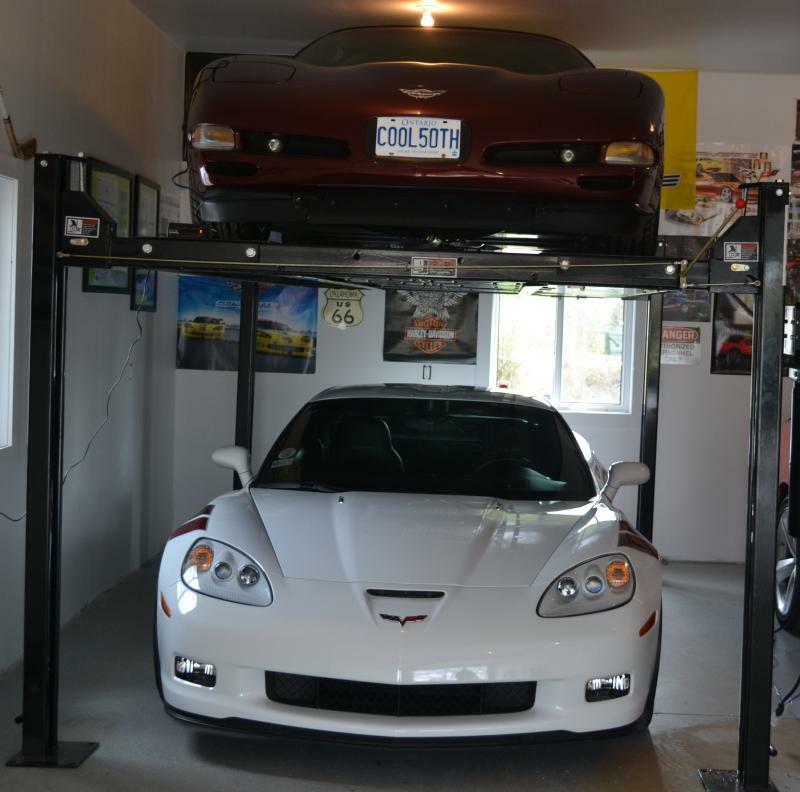 Floor to bottom of lift rail (ramp if you like) and in my case in the 4 post locked position which allows the C6 or ZR-1 to be on the bottom is 50" and the height of the C6 (which lowered 7/8") is 48.5" and the ZR-1 is 47.5". Point is with a low type ceiling (which I consider mine to be) you have to watch the height of the cars. Some say it looks tight...well it is but whether an 1.5" clearance or 1 foot clearance- clearance is clearance. 4. 4 post column height... in the case of the Direct Lift Pro 8S I have the columns are 84" which easily clears the garage door when open. 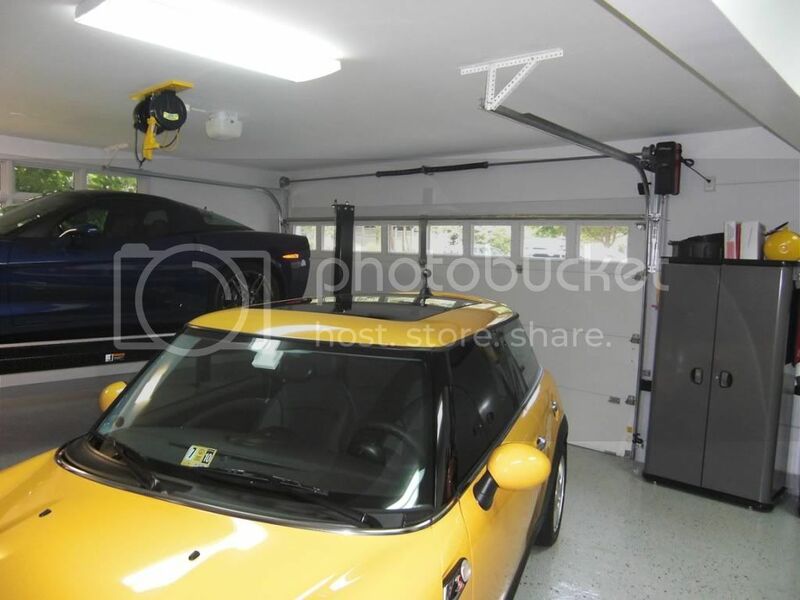 Basically if you have two cars that are 49"-50" in height each and have a ceiling that is no lower than 107" and use a Direct Lift Pro8 (lower column height and the deck lock points are at a good height) and a garage door when open that no point is closer to the floor that around 94" then you are good to go. 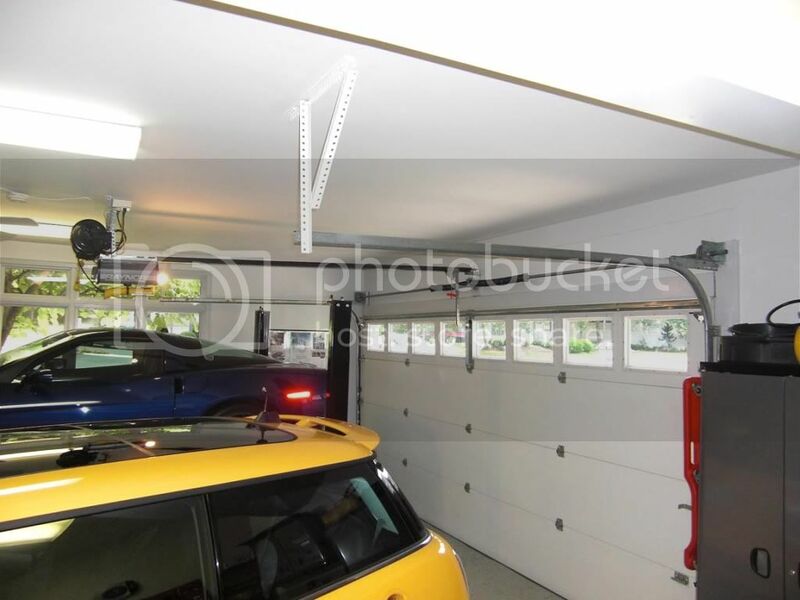 More ceiling or garage door height then most assuredly good to go. Last edited by C6FirstVette; 06-10-2011 at 05:34 PM. If I was doing it again I would use the wall mount Liftmaster. Wow...lots of great info there...thanks a ton! I'm still getting over the sticker shock of the ballpark quote I got for raising the rails, changing the door springs, and installing the 3800, so I don't know if I'll end up going that route now or not (in the middle of dealing with a hail damaged roof, too...gotta love timing, huh?! ), but all of the info in this thread is much appreciated! If you have a 10' ceiling, you can fit any combination of C3, 4, 5, 6 on top or bottom with the regular center garage door opener. I still have 6" clearance between the roof of the top car and the opener and plenty of space for the bottom car. Where do you live? I am in NJ. I am getting a C6 between now and next spring. 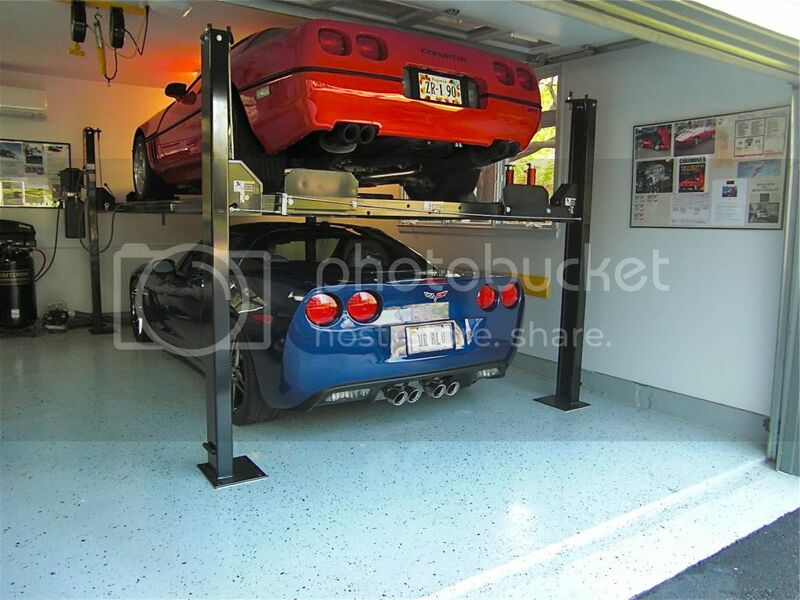 I have a 2 car garage with 14 foot ceilings. I am changing the door opener to the jackmaster 3800 and plan on running the garage doors straight up the 14 foot wall to make room for a 4 post lift. To change the 2 door opener and springs is going to run me roughly 2200. I received quotes as high as $3000. If you are in NJ I can forward the company I am using. Thanks for the offer AC, but after getting an on-site quote that wasn't quite as bad, looks like I may be back on track to getting the Liftmaster 3800 afterall. For those that have the 3800, is it compatible with the built-in Lear remote in the Vette sunvisor? My existing opener would never work with the Lear. Last edited by DWS44; 06-16-2011 at 04:54 PM. Location: Ontario and Kissimmee Fla.
you guys are giving me ideas that involve me spending lots of money.... BAD BAD BAD!!! For those that have the Liftmaster 3800, is it compatible with the built-in Lear remote in the Vette sunvisor? My existing opener would never work with the Lear. Liftmaster (AKA Chamberlain) belt drive. They make ~ 75% of openers sold. and get the one with battery back up. We did and surprised how nice it is when lights go out. What brand of lift is that? Looks like it will work with 8-10f garage. The Liftmaster 3800 jackshaft opener is the way to go with torsion springs. Absolutely nothing overhead. I'll soon be installing two of these in my outbuilding. My main garage has three 12-year old Liftmaster belt drive openers in it which have been completely trouble free (the 3800 was not available when the house was built). When they fail (and if I can't repair them), 3800s will go in. Liftmaster/Chamberlain/Craftsman are built by the same folks. The 3800 is only available as a Liftmaster. I just put 2 3800s in this year, they lift my 10ftx10ft doors no problem, and they are pretty heavy, r18 insulated. They work fine with both my vettes home link and Lear.